This is no casual salad with prosciutto, and it is surely substantial enough to serve as a main entrée and festive enough for a special occasion. This salad with prosciutto is well-balanced and tremendously appetizing. Fregola, a small, round pasta that hails from the island of Sardinia presents layers of flavor and a pretty presentation. The quail, which is readily available and fairly simple to prepare, offers amazing flavor and moistness. What could be more rewarding than anything wrapped in crispy Prosciutto di Parma? In a large bowl, combine olive oil, red wine vinegar, garlic, thyme, rosemary, oregano, and chili flakes. Add quail, rub marinade over all surfaces; cover, set aside to marinate for at least 1 hour*. On a large sheet pan, toast fregola until fragrant, 5-10 minutes. In a large saucepan, bring salted water to a boil and cook the toasted fregola at a rapid boil until al dente, 8-12 minutes. In a large bowl, toss dates, raisins, apple, pine nuts, parsley, celery, lemon juice, extra virgin olive oil, salt, and red chili flakes. Add cooked fregola and adjust salt and red chili flakes. Set aside. Remove quail from the marinade and season generously with salt and pepper. In a large sauté pan over high heat, cook 2 of the quail, 3 minutes on each side. Remove from pan and set aside. Repeat until all quail are browned. When cool enough to handle, wrap each quail in one slice of Prosciutto di Parma. In the large sauté pan over high heat, cook for one more minute per side until the Prosciutto di Parma is crispy. 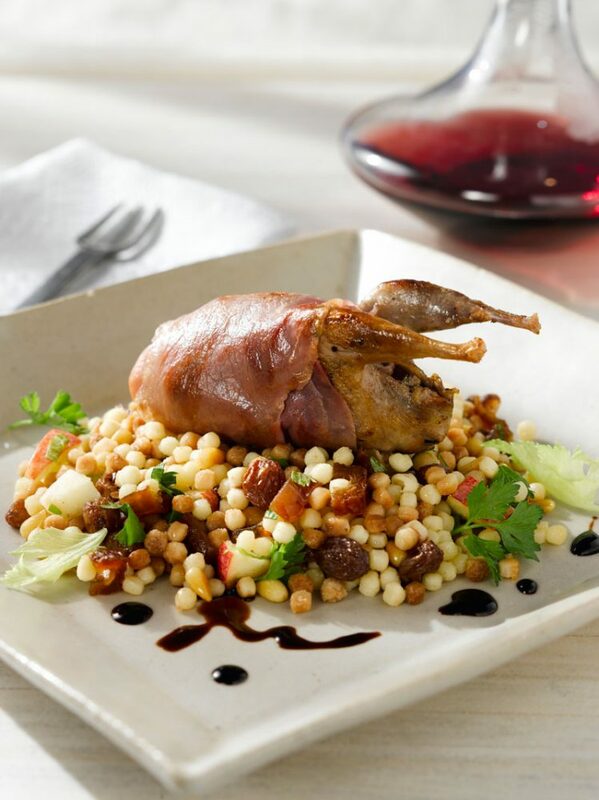 Serve the quail over a bed of fregola salad and drizzle Saba over the plate.